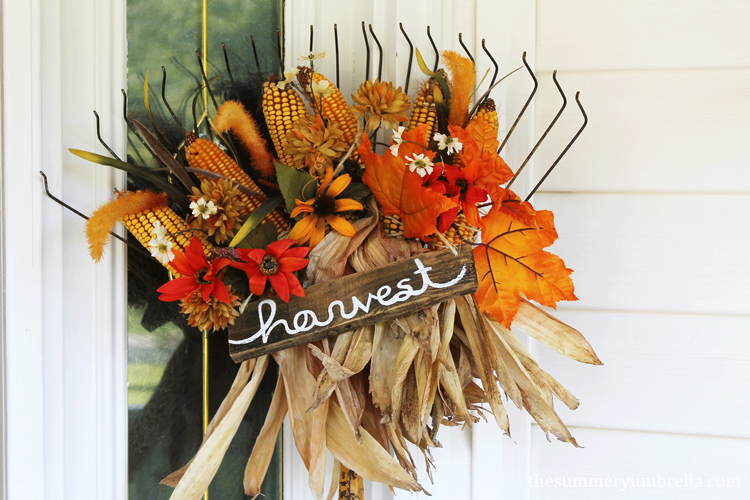 All you need to make this festive DIY fall rake decor is an old rake, some fall foliage and dried corn to create this beauty. 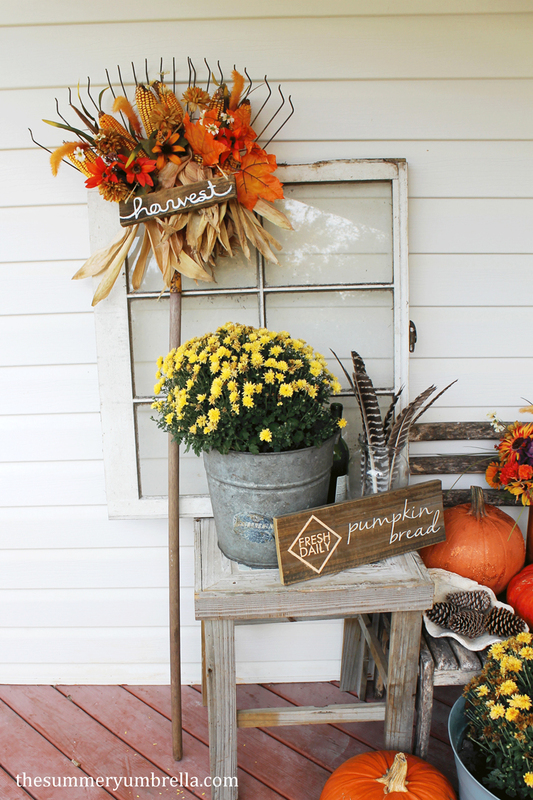 I’m really excited to share this ridiculously, super-duper and easy DIY fall rake decor post with you today! Seriously, I think the hardest part of this whole project was painting the word “harvest” on the sign, and you could definitely use a stencil to make this part a cinch. Plus, do you remember my inspiration post a few weeks back about using corn decor? I am happy to say that I found a use for a few cobs to use in my fall decor. Yay! First, roll down the husks on all of your corn cobs. 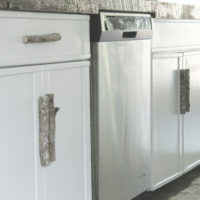 You can use any number of cobs that you would like for this project. I choose to use six since they fit on my rake the best. Then, grab your rake and using your twisted rope tie one corn cob (with the husk facing down towards the handle of the rake) to the rake. At first I was a little worried that my rope would really look awkward if I used to much of it, but thankfully it can easily be covered up using your artificial flowers. So, don’t worry about what it looks like at this point. 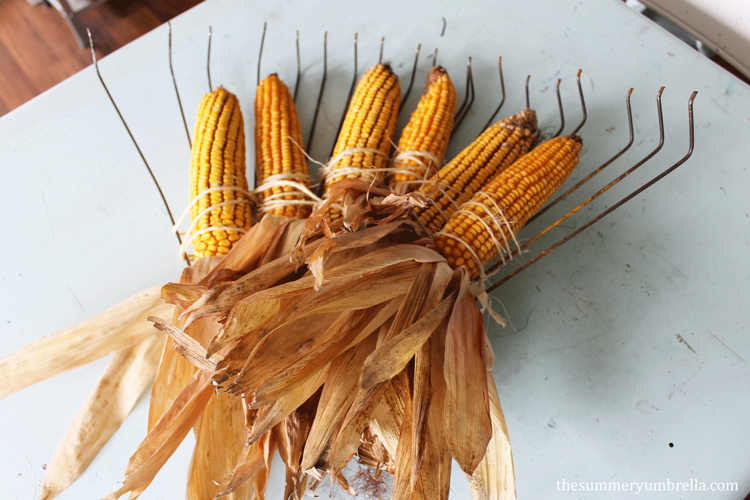 Just tie your corn cob onto your rake as securely as possible. 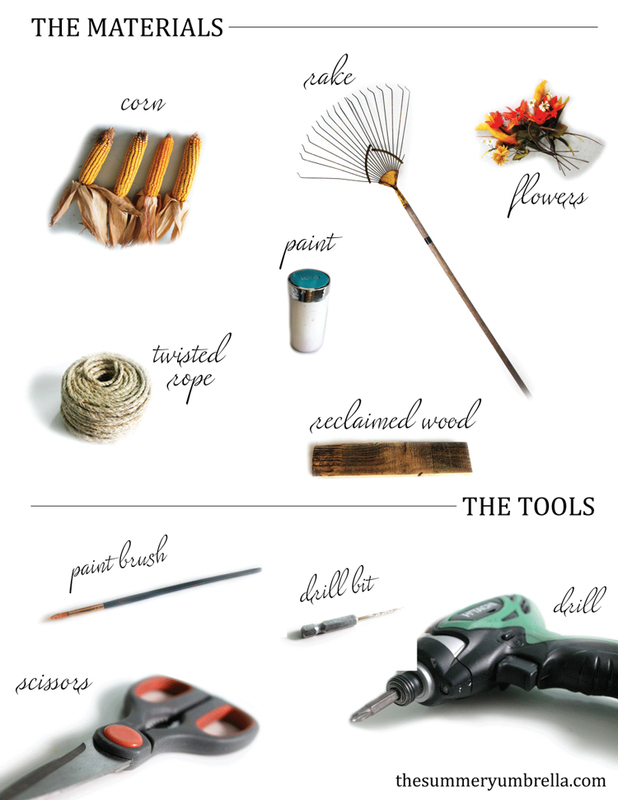 Don’t have a rake on hand to use? 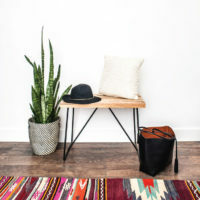 Search for a vintage or upcycle one from your local thrift shop. As you can see in the below picture I found that each cob only needed to be wrapped with my rope a few times. Next, randomly stick your artificial flowers in between, in front and behind your corn cobs. I don’t have an exact method for this madness so I would suggest just trying what looks best to you. The beauty of artificial flowers is that they can be twisted, turned and manipulated into the position of your choosing. Use this to your advantage! Then, with a scrap of wood for your sign, drill two small holes into the top left and right corners. Slip your twisted rope into one hole and tie a knot. Next, place your sign onto your rake to see how long you would like your sign to hang. After this has been determined go ahead and cut the correct length of the rope and put the final knot into the second hole. As I stated before, the hardest part (which I really don’t think was that hard ;) was hand painting the word “harvest” onto the sign. If hand painting is not your forte don’t fret, just use a stencil. This will make it a hundred times easier, or you could even forego the sign altogether. Last, enjoy this beautiful masterpiece that you have created! See, wasn’t that suppppperrrr easy? You can put this rake just about anywhere to welcome any guests that you have coming over to your home, or just put it up for you and your family. Either way, it’ll definitely be a great addition to your fall decor! Side note: I left my rake out in the rain one day just to see how it would hold up. It didn’t fall apart, but I don’t recommend having it directly in a location where all of the elements could potentially wreck havoc on it day after day. One or two days would probably be fine, but that’s probably about it. Just my observation! 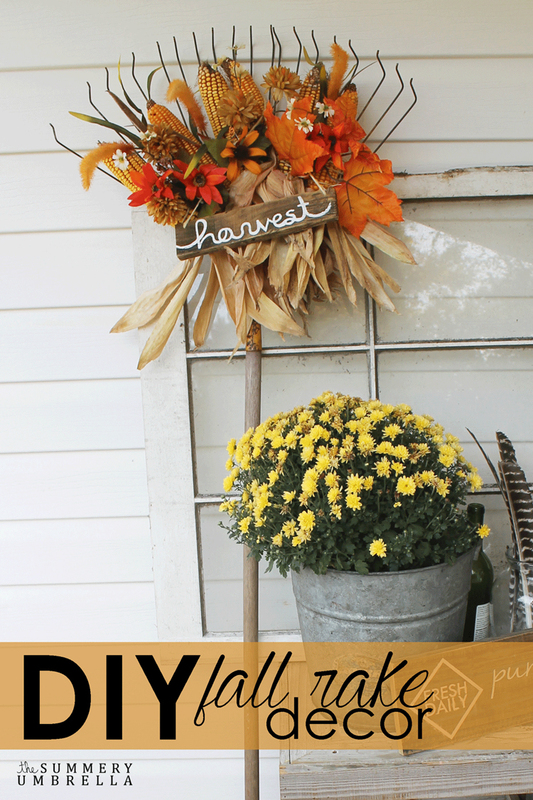 Have you ever put together a DIY fall rake decoration? If so, tell me about it! I’d love to see other inspirational ideas!